Key West BrewFest is a fitting way to celebrate the end of summer over Labor Day weekend. This year marks the event’s eighth year, chock full of activities across Key West with participating hotels, restaurants and bars. Last year’s BrewFest chalked up approximately 200 options for beer enthusiasts, and its signature tasting festival sold out after just two hours. BrewFest officially kicks off Thursday, Aug. 31, and stretches over the weekend with a variety of activities through Monday, Sept. 4. Beer classes, tastings, brunches and beer bingo guarantee something to drink for everyone. 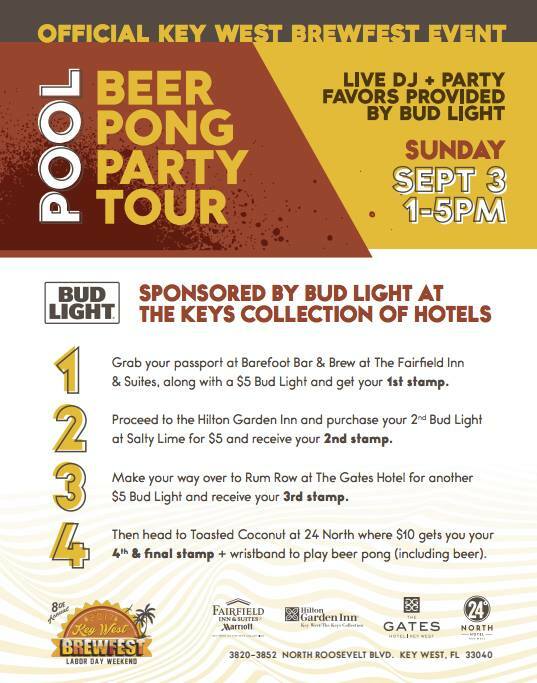 24 North Hotel is pleased to be part of the Bud Light Beer Pong Party Tour, along with three other participating hotels. The poolside day event takes place Sunday, Sept. 3. It’s set up as a hotel ‘pub crawl’ of sorts, running from 1-5 p.m. Visitors are invited to collect stamps at participating hotels as they make their way to 24 North’s Toasted Coconut outdoor restaurant, where Bud Light beer pong games are held poolside. A $10 wristband earns you beer pong game time, with Bud Light flowing freely amidst prize giveaways and music provided by a live DJ. 1. Start at the Barefoot Bar and Brew pool bar at the Fairfield Inn and Suites, located across the street from North 24 Hotel, where you grab a passport, and with a $5 Bud Light purchase, earn your first stamp. 2. A two-minute walk across the street brings you to the Salty Lime at the Hilton Garden Inn. There, purchase your second Bud Light and receive your second stamp. 3. On the same side of the street, take a quick stroll to Rum Row at The Gates Hotel. Another Bud Light will earn you your third stamp. Rum Row will host live music for the event, complete with prizes and giveaways. 4. Onto Toasted Coconut at 24 North Hotel – where $10 gets you your final stamp and a wristband to play/drink Bud Light. Live DJ and party favors will be provided by Bud Light. The four participating hotels are all located within short walking distance of each other. Remember to drink responsibly.